The Antarctic Peninsula juts into the Southern Ocean, reaching farther north than any other part of the continent. The southernmost reach of global warming was believed to be limited to this narrow strip of land, while the rest of the continent was presumed to be cooling or stable. Not so, according to a new analysis involving NASA data. In fact, the study has confirmed a trend suspected by some climate scientists. "Everyone knows it has been warming on the Antarctic Peninsula, where there are lots of weather stations collecting data," said Eric Steig, a climate researcher at the University of Washington in Seattle, and lead author of the study. 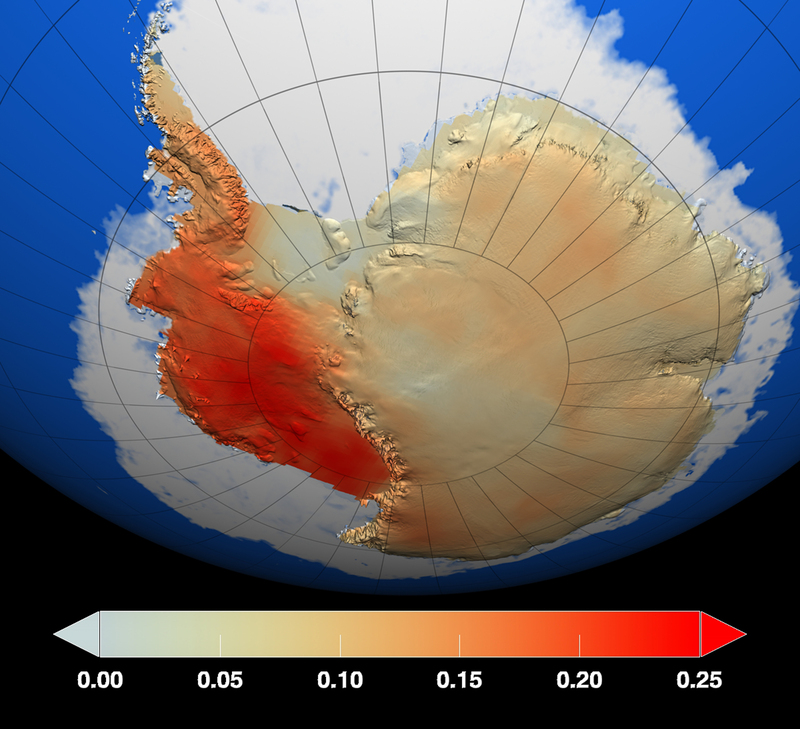 "Our analysis told us that it is also warming in West Antarctica." The finding is the result of a novel combination of historical temperature data from ground-based weather stations and more recent data from satellites. Steig and colleagues used data from each record to fill in gaps in the other and to reconstruct a 50-year history of surface temperatures across Antarctica. Over the years, climate research in northern latitudes led researchers to believe that the Arctic is where impacts of global climate change would be seen first. Less certain is how climate is affecting Antarctica where inland temperatures are known to plunge to -112°F, and ground-based weather stations have been sparse. It's this sparse data collection — from ground-stations on the Antarctic Peninsula and previous reports that much of East Antarctica has experienced cooling since 1978 — that led the International Panel on Climate Change to conclude in its most recent report that Antarctica is the one continent where we have failed to detect human-caused temperature changes. With funding from the National Science Foundation's Office of Polar Programs, Steig and colleagues set out to reconstruct Antarctica's recent past. Ground-based stations have recorded temperatures since 1957, but most of those readings come from the peninsula and areas on the edges of the continent. But at the same time, scientists such as study co-author Joey Comiso of NASA's Goddard Space Flight Center in Greenbelt, Md., have been gathering measurements from a series of Advanced Very High Resolution Radiometer (AVHRR) instruments deployed on satellites since 1981. To construct the new 50-year temperature record, the team applied a statistical technique to estimate temperatures missing from ground-based observations. They calculated the relationship between overlapping satellite and ground-station measurements over the past 26 years. Next, they applied that correlation to ground measurements from 1957 to 1981 and calculated what the satellites would have observed. The new analysis shows that Antarctic surface temperatures increased an average of 0.22°F (0.12°C) per decade between 1957 and 2006. That's a rise of more than 1°F (0.5°C) in the last half century. 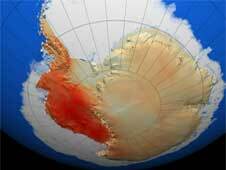 West Antarctica warmed at a higher rate, rising 0.31°F (0.17°C) per decade. The results, published Jan. 22 in Nature, confirm earlier findings based on limited weather station data and ice cores. While some areas of East Antarctica have been cooling in recent decades, the longer 50-year trend depicts that, on average, temperatures are rising across the continent. 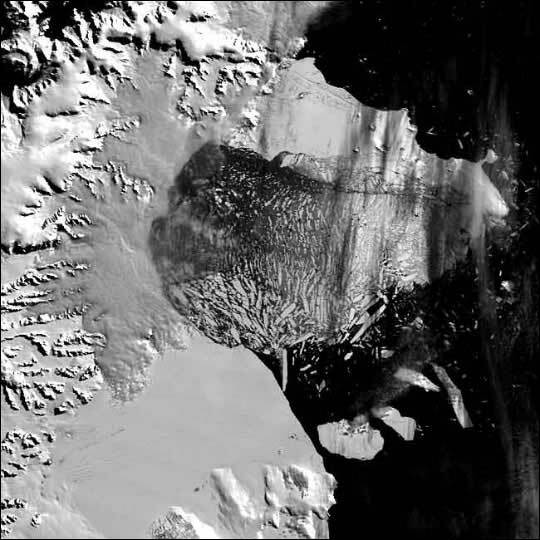 West Antarctica is particularly vulnerable to climate changes because its ice sheet is grounded below sea level and surrounded by floating ice shelves. 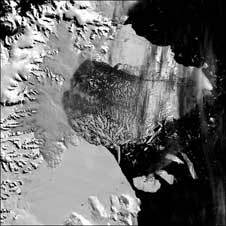 If the West Antarctic ice sheet completely melted, global sea level would rise by 16 to 20 feet (5 to 6 meters). To identify causes of the warming, the team turned to Drew Shindell of NASA's Goddard Institute for Space Studies in New York, who has used computer models to identify mechanisms driving Antarctica's enigmatic temperature trends. Previously, researchers focused on Antarctic ozone depletion, which influences large-scale atmospheric fluctuations around the continent — most notably, the Southern Annular Mode, which speeds up wind flow to isolate and cool the continent. Shindell compared Steig's temperature data with results from a computer model that can simulate the response of the atmospheric system to changes in land surface, ice cover, sea surface temperatures, and atmospheric composition. He found the ozone-influenced Southern Annular Mode is not necessarily the primary influence on Antarctic climate. Instead, it appears that smaller-scale, regional changes in wind circulation are bringing warmer air and more moisture-laden storms to West Antarctica. "We still believe ozone depletion can increase wind speeds around Antarctica, further isolating the interior," Shindell said. "But it's clear now that it's not such a dominant influence on temperature trends." This article was originally prepared by Kathryn Hansen as a NASA Portal "Looking at Earth" feature.